Stumpy Gully Vineyard is located in Mooroduc, the heart of Victoria’s Mornington Peninsula wine-touring region. 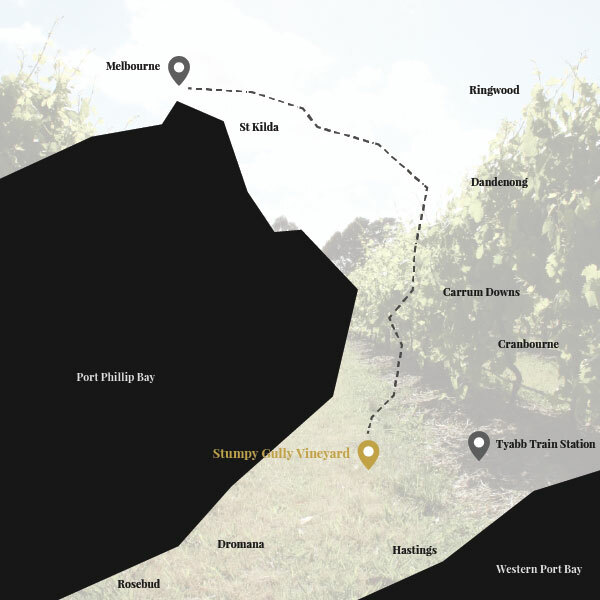 With the recent completion of additional works on the Peninsula Link freeway, Stumpy Gully Vineyard is now just 50 minutes from the Melbourne CBD and an ideal first stop on your leisurely drive around the region’s wineries. Initially famous for its cool climate Chardonnay and Pinot Noir, the Mornington Peninsula’s maritime climate makes for distinctive wines. The fascinating micro-climates can also produce markedly different wine styles from the same grape types grown on different blocks in close proximity. As well as wine, the Peninsula is also a magnet for lovers of good food, country markets, arts & crafts, beaches and water sports, bush walks, picnics and more. Come for the day, or make a weekend of it and stay at a local B & B.